Courir pour l’attraper alors qu’on sait pertinemment qu’il en arrivera un autre cinq minutes plus tard et sauter pour en descendre parce qu’on est trop impatient pour attendre qu’il s’arrête. Les sièges en cuir patiné qui craquent quand on s’assoit un peu trop bien, les cigarettes grillées en cachette à l’arrière en essayant d’éviter le regard amusé du chauffeur. Porter ses écouteurs sans musique pour ne pas se faire embêter; aller s’asseoir exprès à côté de tous les passagers pour les entendre raconter leurs histoires. Bus stoppé à Dora, bus stoppé à Cola, bus stoppé partout parce que Fawda w ma fi dawle, habibte, c’est ça, Beyrouth. C’est ça, Beyrouth, ou en tout cas c’est beyrouth par morceaux, et ça n’a jamais été autant Beyrouth que dans les fragments de vie que l’on capture à bord du bus. Bus 15 bondé en milieu de journée avec les piétinements des passagers debout qui forment une dabke folklorique sur des musiques de 2011; bus 15 solitaire de 4h du matin, tu ne sais pas ce qu’il fait là, il est désert, furtif et il roule plutôt vite. Les chewing gums à l’abricot, les colliers de jasmins, les billets de 1000LL et les camel qui passent de main en main. Les pelures de bezer partout par terre, les restes de café qui jaunissent au fond des gobelets. Le bus en août et sa chaleur suffocante qui se mêle à l’odeur des gardénias flétris. La pluie d’octobre qui suinte à travers la fenêtre mal fermée. Le coucher de soleil insignifiant et majestueux de janvier sur la corniche. En mai on ne prend plus le bus on marche. Les ados qui descendent à Gemmayze pour humer l’interdit et brûler leurs ailes sur le bitume âcre de la nuit tombée, les amants qui semblent n’aller nulle part et les ouvriers qui reviennent de Cola avec le sentiment du devoir accompli. La plupart ne savent pas où il va, mais reconnaissent par où il passe. Le bus 15 en escarpins en revenant de Mar Mikhael, le bus 15 en baskets après un jogging avorté sur la Manara. On décide de s’arrêter au Luna Park, on monte dans la grande roue déserte à 4000LL, et on regarde enfin les bus microscopiques d’en haut, qui rythment inlassablement le trafic de leurs striures blanches. I usually run to catch it even though I know for a fact that another one will come five minutes later; and I jump to get off because I’m too impatient to wait for it to stop. With its patinated leather seats that crack when I make myself a little too comfortable, and the cigarettes I grill on the back seat trying to avoid the amused glance of the driver. Sometimes wearing my headphones without music to avoid being annoyed, sometimes sitting on purpose near all passengers to hear them tell their stories. Bus stuck at Dora, bus stuck at Cola, bus stuck everywhere because “fawda w ma fi dawle, habibte, this is Beirut.” This is Beirut; or at least, pieces of Beirut, and never has it been more Beirut than in the fragments of life you get to catch onboard. Bus 15, overcrowded in the middle of the day, where the feet of passengers standing draw a folkloric dabke on songs from 2011; bus 15, solitary at 4am, you don’t know how come it is still on the road, empty and stealthy. Apricot-flavored gums, jasmine necklaces, 1000LL bills, camel running from hand to hand, with bezer shells all around the floor, and coffee leftovers yellowing the wrinkled plastic cups. The bus in August and its suffocating heat, rising up in the air along with the mesmerizing smell of rotten gardenia. The October rain oozing through the half-closed window. The meaningless and majestic sunset of January on the corniche. In May, I don’t take the bus — I walk. The teens that get down at Gemmayze to smell the forbidden and burn their wings on the pungent asphalt of the falling night; the lovers that aren’t heading anywhere, and the workers coming from Cola with their satisfacted sense of accomplishment. Most of the riders don’t know where the bus is going, but they are certain it will pass by some place they know. Bus 15 wearing stilettos after an evening in Mar Mikhail, bus 15 wearing sneakers after an aborted morning jog on the Manara. I decide to stop at Luna Park, I pay 4000LL to climb in the deserted big wheel, and I finally catch a glimpse of the microscopic buses seen from above, relentlessly punctuating the traffic with their white streaks. How Can Public Transportation Curate your Perception of the City? 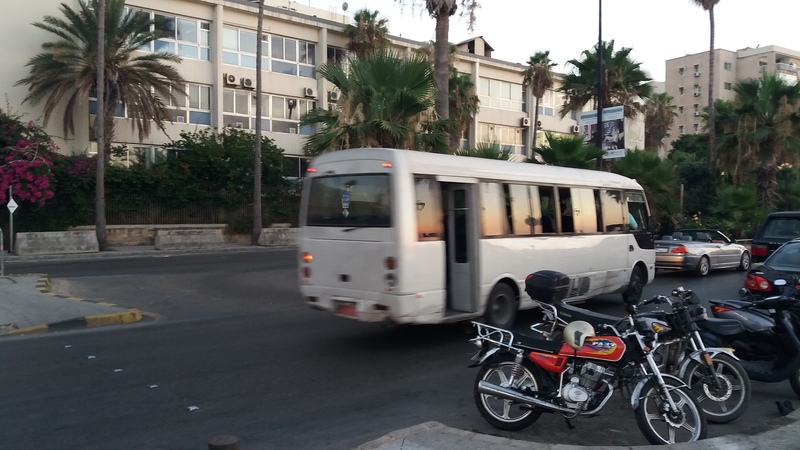 “We took Bus 15 from Ain el Mreisseh — we weren’t sure where it was heading, so we decided to stay on the bus, to see if it would take us back to Ain el Mreisseh. We had to take another bus at Dora; the whole trip took us 2 hours,” they explained, as they told me about their very first bus ride. Taking the bus without knowing where it was going became a new way to marvel at things they usually pass by without noticing. From this perspective, public transportation can be a way to awaken curiosity, raise new questions and imagine new answers. Sara and Sirene still see that lack of information is the main problem regarding buses. “We were asking riders for information. Most of them did not have any idea regarding the final destination of the bus, but rather, they knew that the bus would pass by the place they were going to.” However, by choosing to go beyond this uncertainty, the two volunteers subverted their lack of familiarity with the whole system into a new way to poetically apprehend the urban environment we all are entangled in. Their second trip was much more ambitious, and saw them taking a van from Jnah to the Bekaa Valley. This experience allowed them to think of and speak about the bus as a truly public space, appreciating the social diversity that is ‘consubstantial’ to their own being. Buses are part of the urban environment, but they still remain invisible to a large part of the population that knowingly or unknowingly chooses not to see them. And curiosity is the first step of that first step of understanding these invisible yet ubiquitous buses that shape the urban life of a silent part of the population. Get curious, and start taking part in this latent conversation. As integral but somewhat underappreciated public spaces, Lebanese buses offer the city lover a rich and multi-layered slice of urban life. The bus is not only a mean of transportation: it is a place of social mixity and multi-culture that sparks conversations across class, gender and national background. 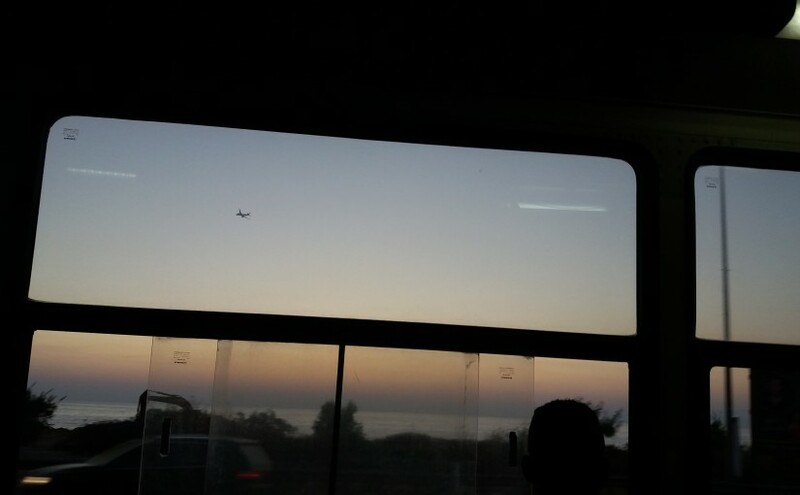 Commuting in a Lebanese bus is a window to a gallery of unique and yet relatable personalities. Scroll down and let’s see how many of them you’ve already spotted! And let us know if there are any we’ve missed. He knows every driver by name, remembers the time Beirut had a tram (riz’allah), and feels entrusted with a mission to convince the driver to take every shortcut possible while complaining about traffic. Often mistaken for the Habitué, this guy may or may not be a regular rider. In fact, he may only get on board if that front seat next to the driver is available. An aspiring DJ, he ensures Shiraz is playing on the stereo at least 5 times every hour. 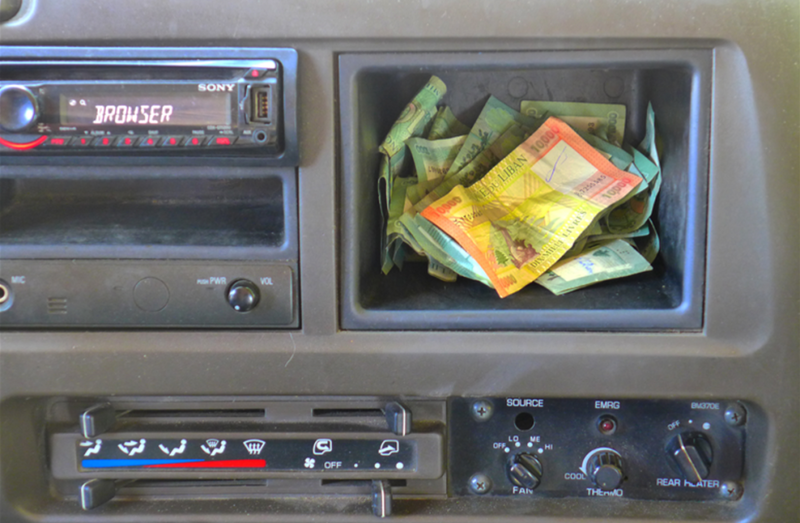 A brilliant multi-tasker, he manages the money handed to the driver and turns the AC on and off every half an hour, whether the windows are still open or not. He is alone, he is manspreading so wide that my teta could sit between his thighs, and he does not want to be bothered. Not to be confused with #6 (see below). Usually a man, he takes pride in his chivalry and amazing balancing abilities, and will end up crushing your feet. Some day, he will convince the whole bus to start a dabke to “Jenno Notto” while going full speed through Hazmieh. 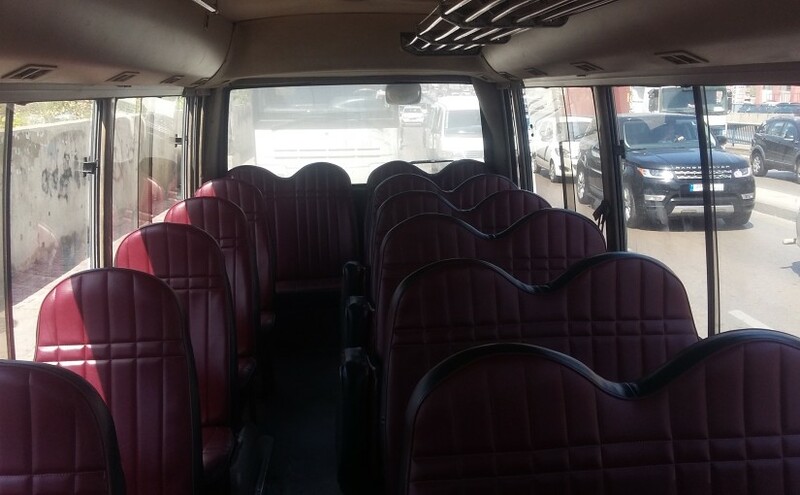 Once difficult to spot in the wild, now often found in the legendary Van Number 4 (“it’s so in right now”), they blast their own music regardless of the dabke already playing in the bus. The driver will usually give up after ten minutes and the whole van will be bouncing over Kendrick Lamar’s new album (“Sit down. Be Humble”). They sit at the back, Instagram-ing every time the bus stops, and have started drinking from their Jagger flasks at 11 am. Think that #12 and #13 are yiiiiiii, 7araaaaaam. They are more at ease with Lebanese public transportation that you will ever be. They have a Zawarib Guidebook in hand, comfy Birkenstocks and overstuffed backpacks that take up a whole seat, and their faces are liberally caked with sunscreen. #1 and #2 will compete over who has the best directions from the mafra2 closest to their destination. You don’t know what kind of mysterious agreement they have with the driver, but he will wait for them if they are not at their usual spot at the usual time. An elite subset of this group is the Hyper-Zboun: they are so in tune with Standard Bus Time, the whole system is thrown in disarray if they are not present at that exact spot, at that exact time. He does not look or talk to anyone, acts as emotionally detached as possible, but when Fares Karam comes up, he can’t help but follow the rhythm with his fingertips on the window. He’s thinking of starting a blog about bus stories. Usually headed to L’Orient-le Jour and always late, she carries an unread book and speaks in French on the phone during her whole trip complaining about the noise on board. Likes self-referential narratives. Often a cop or a soldier, sometimes bolees baladiye, sitting alone. 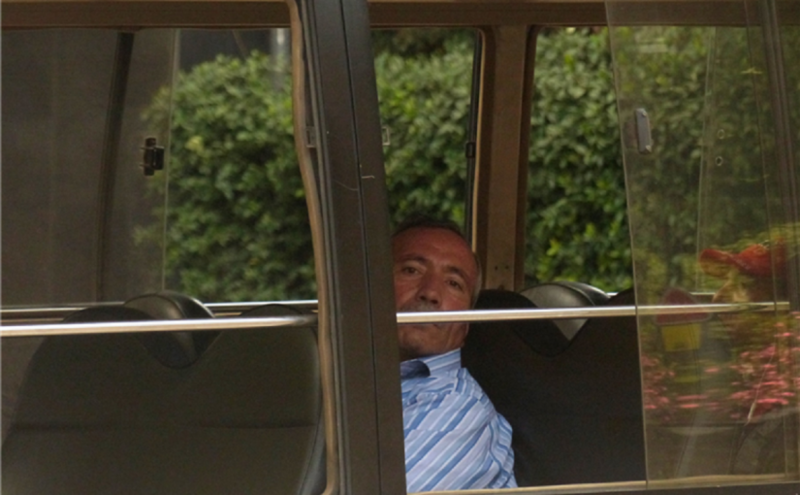 He is side-eyed with a mixture of admiration and curiosity by the driver and other passengers. AKA “ghanoujet el bus,” she is wearing stilettos, she knows every driver, and she is allowed to sit wherever she wants. You do not know where she is headed, but she makes a point at approaching every woman on the bus to ask her about the reference of her lipstick or the address of her hairdresser. AKA “jagal zameno,” this man is a local, and a harmless romantic that sees public transportation as a real life Tinder experiment. He will be frightened by your annoyed look and will sit alone for the rest of the ride, probably pondering about Plato’s theory of soulmates in The Symposium and other existential questions. She climbs in at Ashrafieh, wraps herself in her fur and mumbles to her massive dog Stella in French during her whole trip. 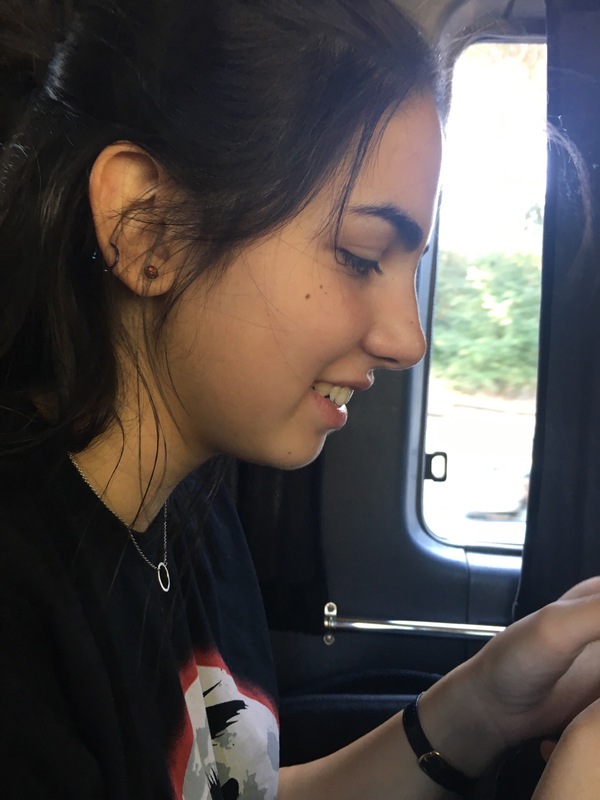 Complains loudly about how slow the bus is whenever she gets a phone call. They are all migrant domestic workers on their one day off, on their way to their diverse denominational churches, like St Francis Catholic Church in Hamra, or the Ethiopian Orthodox Church in Ain Aar. Despite their linguistic and religious backgrounds, they are united by their common experiences with the “misters” and “madams” of Lebanon, and their shared love of Dora weekend shopping. They play musical chairs and change seats at every stop, never missing a beat in their passionate conversations. Party-goer or work commuter, you do not know how long he has been asleep and whether you should wake him before he misses his stop. He usually emerges from his half-coma at Cola and leaves the bus swearing, before immediately taking another bus in the opposite direction. Fidgets at every stop and thinks that sticking his cigarette outside the window is just the right amount of consideration he can offer his fellow passengers. Locked in a glaring war with the Syrian driver while pretending to not see the sixty No Smoking signs throughout the Lebanese-owned bus. Some say this man is a myth, but one or two bank employees have been spotted in the wild. He is wearing a suit and tie, instantly elevating the sophistication of the whole journey. Often seen sipping a tiny plastic cup of muddy coffee. A friend of the actual driver, they exchange seats when one is tired or feels like handling the music, or when one of them doesn’t have the right paperwork. He drops money likes a 90’s R&B music video and leaves the change to the driver. Dolla dolla bill y’all! Collective Mapping: A New Way of Reclaiming Public Space? How can a map become a tool to change your perception of urban environment? 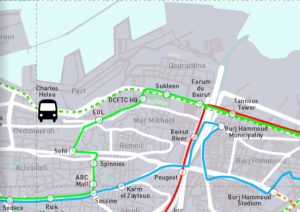 The Bus Map Project has been asking this question for two years now, trying to build support for a “Collective Mapping Action.” Last summer, we distributed a small batch of a prototype map of Beirut showing bus lines pieced together route by route by the small team. This summer, BMP has grown to include nine volunteers who are criss-crossing Lebanon for the second expanded edition of this map. In doing so, the team is not only participating in a civic service, shaping a map of public transportation that will benefit all potential users; they are also helping move the project to the collective level it was always intended for. Turning every bus rider into a bus tracker, the idea of “collective mapping” represents a pragmatic approach to city systems that leverages daily life and first-hand experience in the service of cartography. Sara and Sirene are two AUB Landscape Architecture students taking part in Bus Map Project’s collective mapping initiative this summer. “We had never taken the bus before, mainly due to the lack of information. So far, we rode it only twice, but it has completely shifted our misconceptions,” they explain enthusiastically. The ultimate aim, then, is to build a broad community of bus riders who are passionate about improving the system through incremental and accumulated effort. That way, every bus user becomes a bus mapper and story teller, and is personally invested in shaping the collective vision of their city. This approach transforms the idea of the map from a compartmentalized and technical design process best left to experts, to a collective conversation involving as many actors as possible, shaped by experience and not theory. 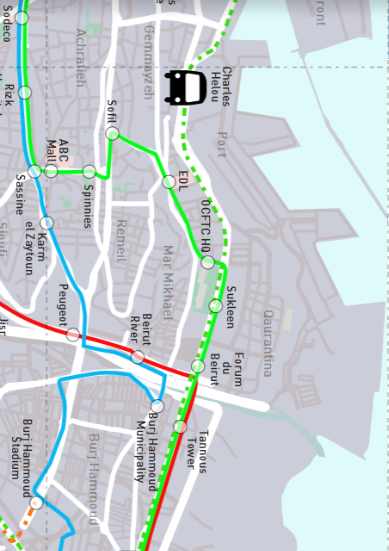 Whether you are a student, a worker, a tourist or simply a curious wanderer, mapping Lebanon’s bus system collectively is a way that re-frames you and your environment along the way: one the one hand, a shift from being a consumer to being a (co-)producer, and on the other, a move from a major problem — of traffic, of chaos, of lack of regulation.. — to a great potential. Maps are political, maps are sociological, maps tell stories, and above all, maps reflect choices: the choice of what you decide to mention in it, and what you leave unsaid. Instead of wondering why we don’t have a bus map in Lebanon yet, let’s join together and steer this conversation. So, how can you be part of the initiative? 1) Download a GPS tracking map for your smartphone (examples: Open GPS Tracker for Android, Open GPX Tracker for iOS, Gaia GPS for Android and iOS, Trails for iOS, etc.). Make sure it has the capacity to export GPX, KML or KMZ files. 2) Get on a bus at its point of departure. 3) Hit record on your app, and make sure your signal doesn’t drop as your ride a bus from beginning to end. 4) Email your file to hello@busmap.me with some background about you and your journey. Bus Map Project is not only collecting routes: we’re collecting voices, experiences, stories… And we cannot wait to discover yours! Posted on July 14, 2017 July 15, 2017 Author BMP TeamCategories Updates, ViewsTags Beirut, Collective Map Action, Grassroots Initiative, Lebanon, Map, Public Transport4 Comments on Collective Mapping: A New Way of Reclaiming Public Space?